Although grand landscapes will not be our focus, we will take advantage of the soft light at the edges of the day along with changing (and harsher) light throughout the rest of the day to help expand your creative abilities and the group’s photographic opportunities. During our time in the field, we will share lessons on learning how to see smaller scenes in nature, composition, working with a broad range of lighting conditions, and overcoming technical challenges. 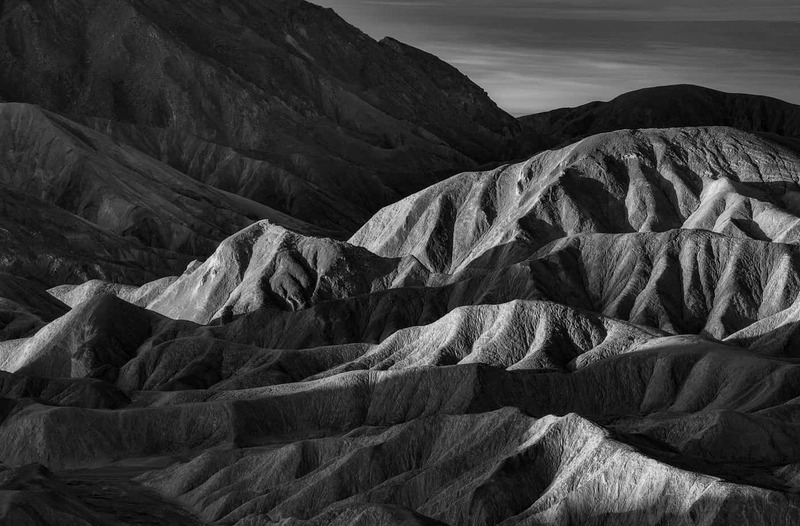 In addition to finding and photographing the best small scenes that Death Valley National Park has to offer, personal expression, exploring creativity, and experimentation will be top learning priorities for this workshop. The workshop will include extensive time in the field (two to three extended field sessions on each full day), guided lessons to extend your learning, time for personal exploration, and formal instruction on photo processing. We will also share many meals to allow time for discussion about all topics related to photography, travel, and the places we are visiting. This workshop will include a mix of easy roadside photography plus hiking to access photography locations. Most hiking will not include much elevation change but will include walking over uneven terrain (like in canyons without established trails) and across sand dunes, which can be physical exhausting despite the minimal elevation change. We may also make one or two short but steep hikes to access viewpoints. Good balance and the ability to carry your camera gear for hours at a time will also be necessary. The photography locations for this workshop are between -252 feet and 7,000 feet in elevation. Hiking will typically be limited to 1 to 2 miles at a time. Transportation - 2 people can ride in our vehicle, others will carpool together. Most locations will be accessed from paved roads or easy gravel roads. If multiple members of the group have 4x4 vehicles, we may be able to access some more remote locations but a 4x4 vehicle is not required for the workshop. Lodging – The workshop will be based out of Furnace Creek, which is the area of the park with the most visitor services. We have a block of rooms held for workshop participants at The Ranch at Furnace Creek. The Inn at Furnace Creek offers upscale lodging, as well. Death Valley National Park has three campgrounds in the Furnace Creek area (Furnace Creek, Texas Spring, and Sunset, the latter of which is best suited for RVs). Furnace Creek Campground accepts reservations, whereas Texas Spring and Sunset do not accept reservations. Meals – Workshop participants will need to pay for their own meals during our time together. We will have two group dinners, one at the beginning and one at the end of the workshop (other dinners will be on your own). Depending on our schedule each day, we will also eat breakfast or lunch together as a group. The stores in Furnace Creek and Stovepipe Wells both offer snacks and grab-and-go foods like sandwiches. You should bring any other food that you want for the trip with you. Furnace Creek is about 2.5 hours from McCarran International Airport in Las Vegas, Nevada. Death Valley National Park’s website offers driving options to get to the park (https://www.nps.gov/deva/planyourvisit/directions.htm). If you want to extend your trip, we can make recommendations for areas to visit for photography in California’s Eastern Sierra region, around Las Vegas, and further into Utah and California.